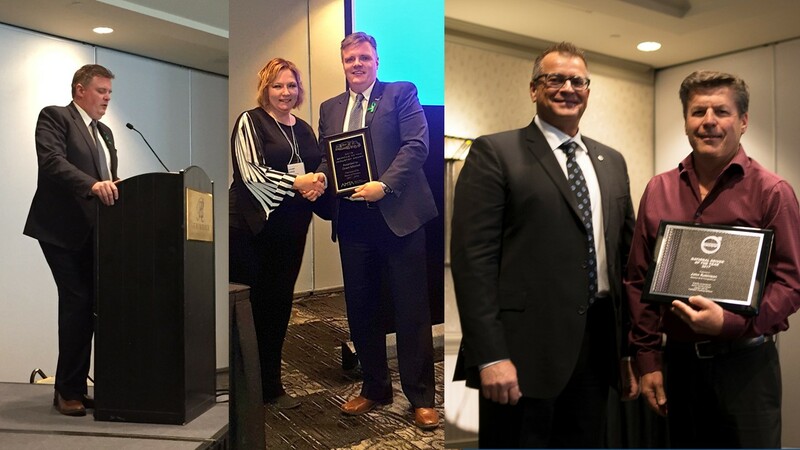 KAG Chief Operating Officer Grant Mitchell welcomed conference delegates to the Alberta Motor Transport Association’s 80th Anniversary Leadership Conference and Annual General Meeting held in Banff, Alberta, Canada on April 20th. During the conference, Mitchell, who served as AMTA’s 2017 Chairman of the Board, received the 2018 Service to the Industry Award for his work on the board and with the AMTA. Also, receiving special recognition that night was John “JR” Robinson who was honored with Canadian Trucking Alliance’s National Driver of the Year Award presented by Randy Muller of Volvo. JR has been a professional driver with KAG Canada’s Westcan Bulk Transport for over 35 years and has driven more than three million safe miles without a preventable collision.